The speculation is ratcheting up about who is about to be arrested, which will likely take place on Monday. If it turns out to be a recognizable name, the expectation is it will be Michael Flynn &/or Paul Manafort (& it could be more than one). When Manafort’s home was raided in the summer, he was told then he would be indicted, while former CIA Director James Woolsey has been telling Mueller of Flynn’s shenanigans he witnessed firsthand. The shady cast of characters like Cohen, Stone & Page may also be in the mix. Suppose a Trump relative gets tagged? That would be interesting! Not just who, but the charges themselves will be significant. If it’s just a financial crime which is mostly seen as isolated to Manafort for example, that would come as a relief to Trump. But if it’s related to the subject of collusion or business ties which could be traced back to Trump, this scandal will be elevated to a whole new level. So we may be just a few hours away from having a bright white light shining down on how much legal jeopardy Trump could be vulnerable to. There’s a good chance the indictment is intended to ratchet up the pressure in convincing the targeted person taken into custody to flip on Trump. It’s very likely more indictments will follow as the dots are connected. Should Trump use his pardon power, that’d be just more evidence of obstruction. 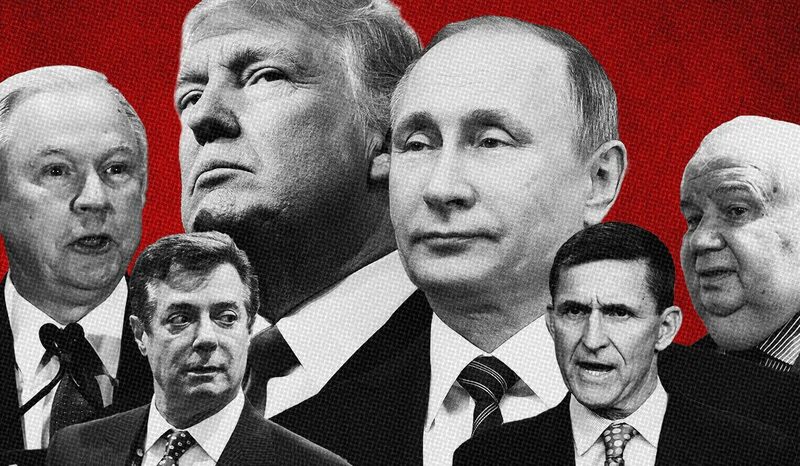 There have been so many connections between the Trump campaign & the Russians, which Mueller is steadily unraveling & we’re all going to know soon enough. Lost in the indictment headline, another bombshell broke on Friday! We found out that Trump Tower meeting last year with the Russians had a direct connection to the Russian government. The Russian lady attending that meeting cleared her talking points with the Kremlin prior to the gathering. Rest assured the topic reaching the highest levels of the Russian government wasn’t about child adoptions. This new evidence is another piece to the puzzle pertaining to that meeting, where the Russians attracted the 3 Stooges (Donny Jr, Kushner & Manafort) with the enticement of having the dirt on Hillary, which Donny Jr. replied with an enthusiastic I love it & confirming late summer would be ideal, which is when the leaked emails did indeed start appearing. Then we have daddy-Donald himself helping write the phony reasons for that meeting while on the airplane, which reveals him as having directly participated in the cover up. So just from the circumstances involving that one meeting, there’s clear evidence of collusion & obstruction. There’s also hordes of evidence from numerous other communications & events, including the firing of Comey, which from all we know so far is likely just the tip of the iceberg of what we’ll ultimately find out. It’s become increasingly evident the deal with Russia was a quid pro quo where Russia would interfere in the election by disparaging Hillary, & in exchange the Trump campaign & his subsequent administration would lift sanctions & repeal the Magnitsky Act. I’m convinced Trump had this deal coordinated with the Russians, which would go down as 10 times worse than Watergate, so it’s just a matter of producing the evidence to prove it. A few years from now when we have the perspective of history, I believe I’ll be proven correct how this dwarfed Watergate. I started saying that early in the year. There’s been plenty of people mocking my prediction, especially conservatives, but wait to see who gets the last laugh. The bottom line to all these investigations, testimonies & indictments are to stop Russia from messing in our elections again, plus find out what was Trump’s involvement in this scandal (or in Watergate lore, what did the President know & when did he know it?). If it’s proven he was involved in collusion (crime of conspiracy) &/or a cover-up (crime of obstruction of justice), plus there’s the added complication of financial dealings (money laundering), he would be required to pay the price which includes relinquishing the presidency. As the evidence keeps closing in directly on Trump, keep this following basic formula in mind. The House impeaches, the Senate convicts, unless Trump first resigns, which I believe could happen in the very near future. Hollywood could never create this kind of compelling mystery drama. But I honestly believe another 3 years with Trump at the helm, America will never be the same & might suffer a permanent decline. A Russia-gate impeachment would temporarily throw our nation into chaos but it is oh so necessary. Expect the final chapter to become the biggest news story/stories of our lifetimes. It could turn out very good or extremely bad. We could see Trump forced from office (the good), but prior to that as a last ditch attempt to change the narrative he might decide to do something rash like launching a preemptive nuclear strike (the bad). If the Russian evidence findings are open to interpretation, it might literally spark a civil war. We face a very rocky road ahead. Please pray for America. Even if the Trump presidency crashes without doing something crazy, it will take a lot of his minions down with him, namely anyone who hitched their wagon to this presidency. To the extent GOP congressional reps never pushed back against Trump & oft times actually stood up for him, there’s going to be a price to be paid in Nov 2018 which could be a bloodbath. In such a scenario it could be years if not a decade or longer for the GOP to recover, if they ever do. Maybe the purge will turn out a blessing in disguise, since a healthy GOP needs to remove any remnants of trumpism, the echo & the part of the base who bought into this mindless exercise of scorched-earth demagoguery. The fallout will hit like an earthquake throughout the GOP when Trump goes down, since he still has more than 3/4 support within the GOP base who’s been influenced by the echo, which explains the reluctance of GOP reps to speak out against him. If Trump gets the boot, the creation of a new party is quite possible. But there’s so much more drama in this scandal than Game of Thrones or Survivor Island or whatever, because it’s real as well as incredibly combustible & bizarre. It directly affects the future of our nation & our lives. Reviewing the related articles, with a flurry of activity lately on the Russian scandal, there are plenty of news stories below at your disposal. The President is trampling on the Constitution & democracy itself in his relentless fight against these very serious investigations, where he ignores the rule of law in trying to discredit any political opposition & any investigators/witnesses who seek to get at the truth. In even denying Russian meddling occurred with our election, he also lays out the welcome mat for the Russians to keep interfering & perhaps even discredit our elections. These are very dangerous matters & we must put a stop to it! Below Russia are links to the GOP civil war which is now out in the open & going on full throttle, including perceptive articles on GOP surrender & Trump’s abyss. From there we see groups of links to the threats on the international scene & the President’s moral character, or lack thereof, since we’ve seen no signs of any. Other articles illustrate the folly of evangelicals selling out to political power (especially aligning with a moral degenerate) over a higher power, badly tarnishing our faith by signaling to the world a willingness to sacrifice their integrity & values. In the final couple links are articles from conservative columnists who heard from GOP Senators after they attended a meeting this week where the President was so rambling & repetitive, they’re worried he might have Alzheimer’s. This is no laughing matter. Perhaps that’s also the most reasonable explanation why this year alone Trump has told verifiable lies that now number into the thousands (yes, somebody out there is keeping count). It’s gotten so bad that most of what he’s saying are now lies or hyperbole. But somehow he has Trumpeters in a trance & they gloss over or deny the lying they hear within their own minds, as if being given over to a cult leader. I include these Kos articles for the benefit of Cubs fan & anyone else living in the rightwing echo-bubble, since this is the type of news they’ve never ever seen before. Sometimes crude, but maybe these vulgar hard-hitting op-eds are what is needed to wake the echo-heads out of their slumber. Whatever it takes we must find a way to talk sense into the GOP base who’ve been so badly deceived or else we’re doomed. I’m not trying to sell them on these far-left viewpoints, I just wish we could drag their thinking further left to come into closer proximity to the center-right. Staying on the radical right guarantees a continuation of unpopular policies, polarization & gridlock, to where leadership is paralyzed from addressing our problems. It’s putting America itself at risk. If we don’t find a way to unite & work towards common goals, GOP & Dems alike, the future looks dim. We need to help conservatives become better informed so they’re not trapped in their bubble of tribal alliances, since it’s imperative we all start looking through the lens of what’s best for America instead of subscribing to a self-destructive allegiance to echo-prejudices.